Plans for my Spirit 27T Build. Looks like a good spot for mounting the cooler. About ready to do that myself. Getting the 351w all setup. A couple pages back in this build thread there are pictures of a 302 I was going to use but I have since decided to go with the 351 windsor. The 351 is completely rebuilt. It's a mild build but it should move the 27 along just fine. More pictures to come as I get things done. Got the engine/trans in place and then put the body on! First time the body has been on with the engine/trans in place. Didn't need to do any trimming to the body. Looks like I'm going to have an 1 1/2 clearence between the pulley's and the electric cooling fan so I'm pretty happy with that. Time to run the fuel line and finish up the radiator mounts and then the frame is ready for paint. Once you get the frame done, things seem to move along quickly. It is always nice when things start falling into place with no hitches. Sometime rare also. Did you polish that manifold? Looks real good in the picture. Going to start wiring on my delivery by the end of the week. I did use your idea for mounting the trans cooler. 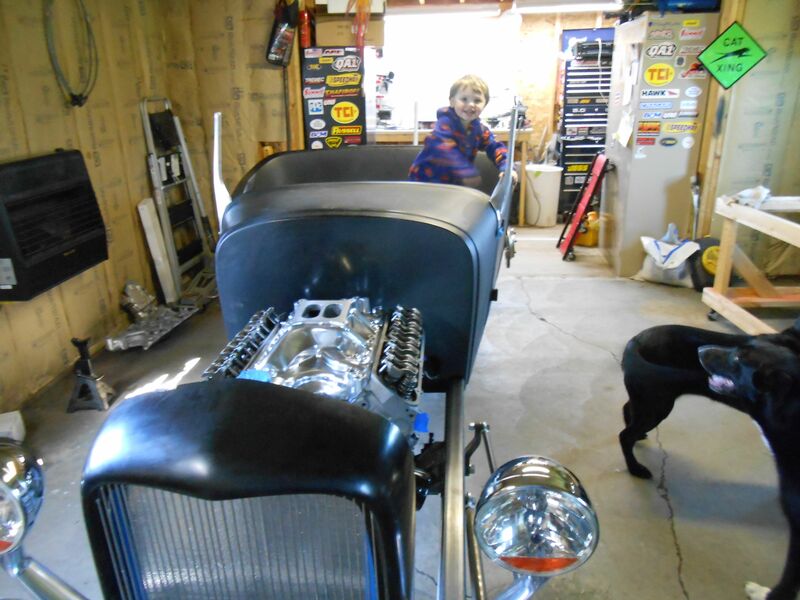 I'm really enjoying the build and my son and wife both love being out in the garage with me. The manifold came out of the box that way! I'm pretty pleased with it. Yea I was thinking of biting the bullet and doing the wiring also before paint. I know I will have to drill and tap some holes for ground wires and I won't know where to put them until I start wiring. I was going to paint mine first also. Then decided to get it on the road first. Work out any problems, if any, then remove body and paint. I will use disconnect plugs for wires that go from body to frame. I think only battery cables and main hot to switch will be the only ones that will be unbolted. I will fool with body work here and there as I feel like it. Alot depends on how much fun I have driving around. Gotta make Bucket Bash. I'm not sure when the body will be painted either. Right now I just want to get something on the frame to prevent rust. I was thinking of just putting a primer on it for now. Getting all the bugs worked out before painting is the way to go for sure. I actually wired my car before paint. Kind of glad I did it that way. It made it easy after paint, less chance of having an accident and chipping the paint because everything is prefitted, cut etc..
Steve how has that push button electric start worked out for you? You like it? Any issues since you've been driving the car? Would you do it again? Well I have close to 2000 miles on the car and has worked flawless. The only downside is it takes no fewer than 5 automotive relays to get the job done. It comes pre-wired and the relays are all tanged together neatly. It sure makes the dash clean though, has a neat illuminated button too. Yeah, why not, I would do it again. I was looking at this one from Watson's. It looks like all but 1 of the relay's are on a circuit board. Who made your's? That's good to know that Wintec sells them. I wonder if Spirit does? Have to give them a call as I don't see it on their website. Had the car out of the garage today to do some work on our cars and thought I'd take a couple pictures of the T!!! Can't wait to get new rims/tires on it instead of the junks that are on it! LOL Still love the way it sits though. Last edited by Mikes27T; 05-20-2013 at 08:09 PM.. Your gettin there Mike, and lookin good. Before you finalize, turn the rear radius bar over. It should be an "S", unless you did that on purpose. Sorry, had to nit pick. Your can do it to me next time. The picture from the rear angle shows the tires more in porportion, and gives it the best look. Ya, tires and wheels make a bunch of difference. What you planning on for that? I don't think that's nit picking! I think that's help! That's for letting me know. I have an idea for what I want as far as wheels/tires. I know I don't like big balloon type rear tires like on a lot of T buckets. I'm thinking 275 60 15's in the rear and 185 or 195 front tires. For rims I'm thinking steel smoothies from Rally America sizes will be 15X10 rear and 15X6 fronts. 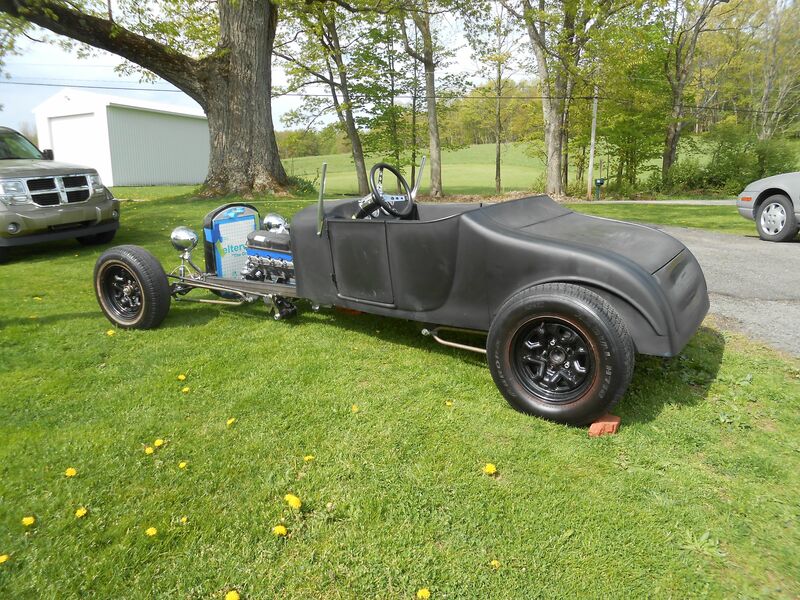 I don't know why in the pictures the front tires look SOO much bigger than the rears. They are all the same exact size. Must be the angles I'm taking the pictures. Last edited by Mikes27T; 05-18-2013 at 01:48 PM..
Looks great. As for wheel/tire combo's, I like the tread width to be close the the rim width. That makes the sidewall shape nice in my eye. Rally America is the way to go. Early Wheel held me up for several weeks. Called Rally and had them in 3 days. Ya, the picture angle got you on the tire deception. Thanks for the info! I've had pretty good luck with the Edelbrock fuel pumps. I've used them on my 69 and 72 Oldsmobile's with no issues. I plan on having an inline fuel pressure gauge so I'll be able to monitor what's going on. 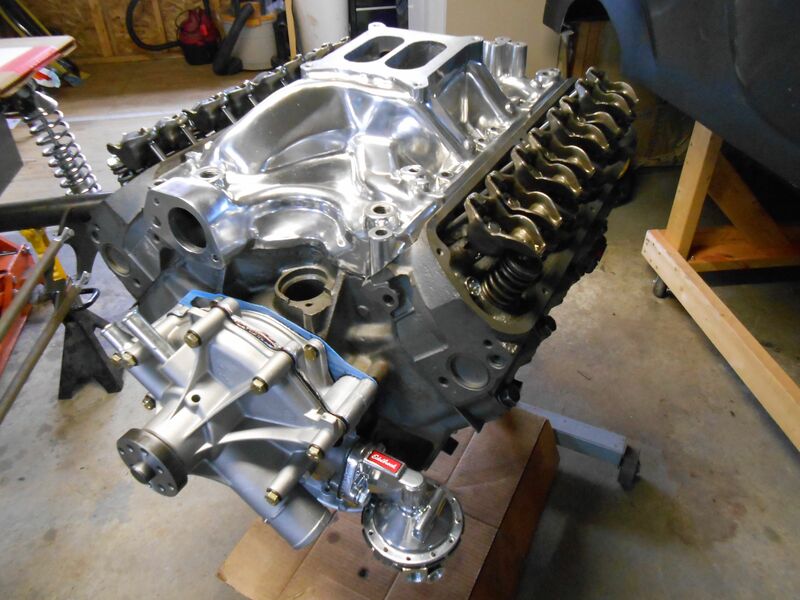 I plan on running a 650cfm Thunder AVS Edelbrock carb. Will a 650cfm carb be ok for a 351 Windsor?? Anybody know? It depends on the compression ratio and the cam. The 650 would be about right for a warmed-over 302 or a very conservative 351, but if you're running higher compression or a high-lift cam you'll want something around 750-780 CFM. for what you have a 650 will be fine for the street! Vol. Eff. @80% = 487 cfm assuming the heads will flow it. so a 650 will be fine. Last edited by INDIAN OUTLAW; 05-25-2013 at 10:04 PM.. Thanks for the posts guys! My 351 is pretty mild. It's running a Ford HO cam and 9 to 1 compression. The only thing is it's been bored 60 over so it's more like a 360 ci. Had to go that big so the cylinders would clean up. Looks like a really nice build, It won't be long before you shake it out. Make sure you get us a short video clip of you first ride. We live for this stuff, you know.